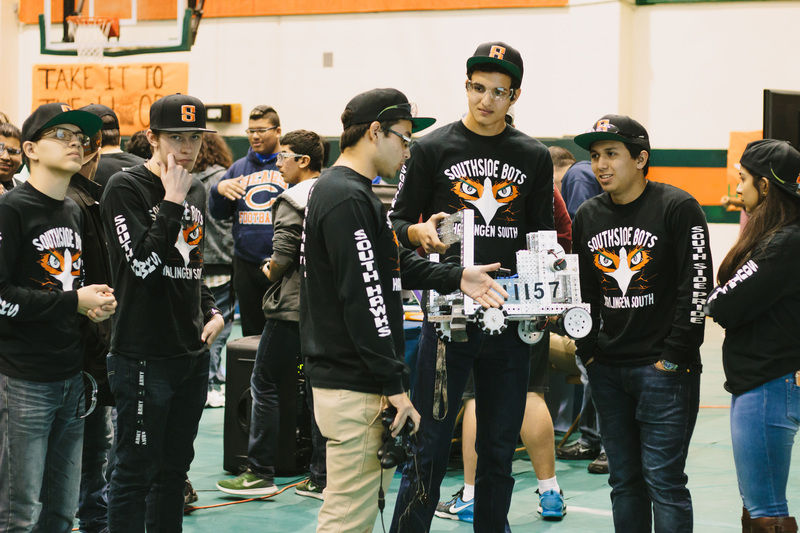 Sounds of cowbells and school chants flooded the Harlingen High School South gymnasium as schools from across the Rio Grande Valley flocked to watch robots do battle on Saturday, January 27. This was no ordinary group of spectators watching a basketball game but Harlingen CISD’s second time to host a FIRST RGV robotics competition. FIRST RGV is a nonprofit, STEM education program that introduces first robotics throughout the valley. “We are very thankful to Harlingen Consolidated Independent School District for starting FIRST at Gutierrez Middle School many years ago, and we are proud to pick it up and continue that legacy throughout the Valley, ” said Jason Arms, the Information Technology Director for the City of Pharr and sponsor of FIRST RGV. With each year, sponsors continue to notice students’ growing interest in robotics as a result of word of mouth through teachers or friends competing in the program. FIRST RGV generates a form of competition that Arms calls “gracious professionalism,” which allows competitors to work side by side with an opposing team to score points to win the match. Because FIRST RGV is a growing program in the Valley, there are a lot of teams that are new to the robotics scene. However, this is not the case for some of the district’s secondary campuses like Early College High School, Harlingen High School, and Harlingen High School South. Another student with robotics experience in her back pocket is Senior Vivian Lopez from Harlingen High School. “This is our first time competing in FTC robotics, but we have taken part in robotics competitions before. I have been competing since my sophomore year,” Lopez said. Pat Roberts has experienced first-hand the impact this type of competition has had on her daughter Danielle Roberts, a senior at Early College High School. Due to the influence of one of her teachers, Danielle Roberts knows what she wants to achieve. Senior Nickolas Rodriguez from Harlingen South also thanks one of his teachers for this experience. “This is my first year in competition,” said Rodriguez. “I became interested in robotics after one of my teachers told me to look into it [robotics].” After he graduates, Rodriguez plans on pursuing a degree in programming. After a full day of competition, HHS took first place in the Red League, and ECHS received second place. Harlingen South took first place in the Silver League. These schools will be competing in the RGV Championships to be held in Pharr, Texas on February 4th, and then the winners will head up to San Antonio to compete for the state title.